As we have seen in The Breakfast Club, being a teenager is hard; but being a teenager whose life has been affected by cancer is even harder. Among the myriad issues facing children in schools across the country is the emotional, social and academic toll of cancer in the family. It is easy to understand and support a child who is diagnosed with cancer, but much harder to imagine the impact for a child whose parent, grandparent, or other loved one is facing the disease. Many times, schools are unaware the family is dealing with this significant health issue; it comes to the forefront after a student’s grades drop, he or she misses classes, or, in extreme cases, acts out in the classroom. Cancer Support Community Central New Jersey (CSCCNJ), located in Bedminster, NJ, understands the importance of providing support for these vulnerable students, as well as the school and childcare personnel with whom they spend the majority of their day. Many times, caregivers, teachers, guidance counselors and other school professionals will become “first responders” in this crisis when students approach them with news of a cancer diagnosis in the family. It is important for school and childcare professionals to feel empowered with tools and knowledge, so, since 2008, CSCCNJ has offered Strengthening Our Schools (SOS) to provide the necessary tools and information to benefit these educators. This annual event, offered at no charge to any professional who interacts with children on a regular basis, is scheduled for October 19, 2018 at the Bridgewater Manor in Bridgewater, NJ. It is a day-long, regional conference that offers tools and information to assist school and childcare personnel in their work with families affected by cancer. Each participant will attend two lectures, offered by nationally-renowned medical oncologists, and a series of smaller workshops led by oncology social work and allied health professionals. Strengthening Our Schools is the centerpiece of CSCCNJ’s year-round efforts to address the significant unmet needs for adolescents and teens facing a cancer diagnosis or the diagnosis/death of a family member. Every week, there are almost 33,000 new cases of cancer, according to the American Cancer Society, and over 1,670 people will die every day, so the problem is unrelenting. In response, CSCCNJ offers school-based support groups during lunches or free periods. Since 2015, in response to the needs identified by school and community personnel at Strengthening Our Schools, CSCCNJ has started groups in five local high schools with plans to move into additional high schools and the first middle school in 2019. Katherine Schaible, LSW, and Program Coordinator at CSCCNJ, facilitates some of these school-based support groups. Schaible notes, “It’s important for these teens to know that they are not alone. The group helps to reduce feelings of isolation and provide a model for healthy coping skills that will carry these students throughout their lives.” By addressing this life changing crisis at a critical state in their development, CSCCNJ can positively impact young people affected by cancer and teach them important coping skills that will last throughout their lifetime. For more information about Strengthening Our Schools, visit us online at http://www.cancersupportcnj.org/sos or call Jill Kaplan, Program Director, at 908-658-5400 x3. 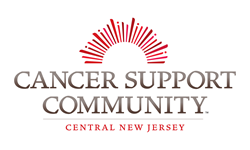 About Cancer Support Community Central New Jersey: Cancer Support Community of Central New Jersey (CSCCNJ) is a registered 501c(3) and an independently licensed affiliate of Cancer Support Community, an international non-profit organization. As experts in oncology mental health, the organization provides support, education, and hope to all people with cancer and their loved ones, so that no one faces cancer alone®. Backed by evidence that the best cancer care includes social and emotional support, CSCCNJ creates a supportive community to help individuals live with, through and beyond cancer. At no cost to patients, family members and caregivers, the organization delivers essential programs and services including individual and group support, educational workshops, nutrition and healthy cooking education, classes to enhance health and wellness and social activities for the entire family. For more information please visit their website at cancersupportcnj.org or call (908) 658-5400. Previous articleLocal Veteran to Release Documentary Film Outlining Serious Malpractice at Audie L. Murphy V.A. Hospital in San Antonio, Texas tonight.